Rachris World Travels: Snow, snow, nick, nick snow. So, we finished our last day teaching in Slovakia and now had a 1,100km sprint down through Eastern Europe to Montenegro where we are house-sitting over Christmas until mid January. We headed home at 2.00pm and still had to scrape the snow from the windscreen and the heavy frost from inside of the van windows, The temperature had dropped to -7 over the last two days so it felt like a freezer inside and looked like an igloo from outside.As we drove the Slovakian drivers took the last opportunity to amuse and scare us as we headed South towards the border. It was going to be a long haul so we were pleased that Slovakia slipped past fairly quickly. The single carriageway roads being relatively empty and the stretches of dual carriageways allowing us to cover the miles whilst we chatted and took in the white blanketed landscape. Fog was starting to obscure some of the fields as we drove and more and more it looked like a desolate, post apocalyptic scene. It's always interesting how the environment, people etc. change when you enter a new country and Hungary announced its arrival with some lovely buildings and a very impressive, dominating castle that cocked a snook at its poorer relation back across the river. 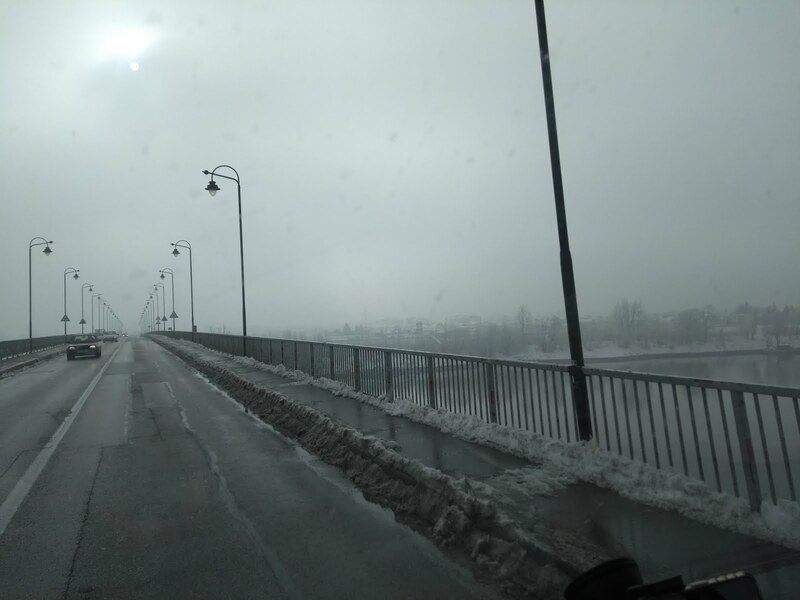 We whizz along the considerably better motorway system for a few more hours until the thickening fog and boredom make us call it a day in Mohacs on the banks of the Danube. It's a lovely town. 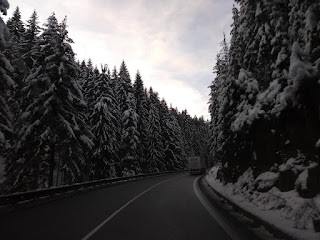 All the Christmas decs were up, twinkling lights reflected on the snowy ground and heavily laden trees lined the roads. We sleep the night in the square beside the town Christmas tree and even with the bitter cold we sleep soundly. Admittedly I did have a scarf wrapped round my head like a turban and Rachel was covered by so many layers I had to give up any idea of egress after some strenuous attempts. The next day we hit roads early and in no time arrive at the Croatian Border. This is a skinny bit of the country separating Hungary and Bosnia. Impatient 'gimme' fingers gesture "Green Card"
Questioning look "Sorry. A what"
Confused look "No. I don't kn..."
Pointing to an empty bay "Wait there"
And so we sit and wait 'there' for 20 minutes watching the mist, sludge and progress of other cars until a man who can smile and very nearly does. Tells us we need to buy a special insurance for the company which is a bargain at 30 euros and will last for 17 days. Didn't see that coming in the travel calculations. Bosnia comes with its recent history still fresh in our minds. It still looks a bit knackered. But part of that is obviously due to the bleak weather and piles of ploughed snow lining the roads. Perhaps we would need to spend longer to make any valid comments but I don't think that's going to happen too soon. Bosnia ain't that big. But, when you have to travel on single lane roads, hemmed in with drifts, driving at speed limits of between 40kph and 60kph and constantly having to brake to avoid crashing into some lunatic who has cut you up because they have misjudged how long it takes to overtake 30 cars in a row - it takes forever. Horrible driving. They had had a lot of snow and whilst the roads had been cleared no one had thought about the pedestrians who were having to clamber over mounds on what might have been pavements or risk life and limb and a sound dousing of sludge spray to walk on the road. All seemingly wearing black and therefore in the gloom barely noticeable. At one point we are driving up an icy hill with no escape route when a double trailer, logging lorry with a full load comes flying down towards us on our side of the road doing 90kph in a 50kph limit to overtake someone who had also been observing the actual rules of the road. Luckily everyone expects this sort of recklessness and all there was to show for the event was our open mouths, two brown smudges on our seats and a spray of cold water on the side of the van as it hurtled past. 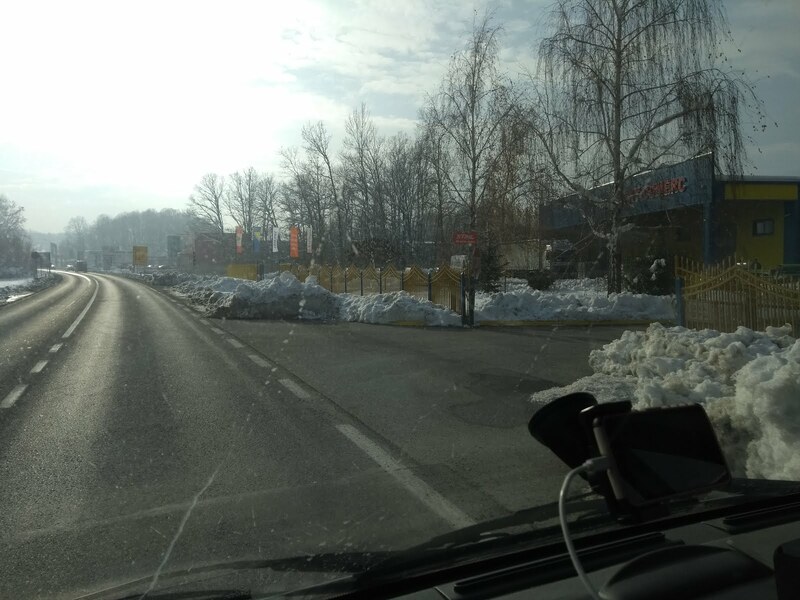 We arrive in Sarajevo and quickly push through the early rush hour traffic to exit the city and head for what will turn out to be several more unexpected hours of mountain road driving. On the outskirts of the city we were travelling at 66kph in a 60kph area when a hidden copper walked out in the road ahead waving a flashing baton. We are just about to curse and pull over when the car behind, who had been tailgating us for some miles and not seen the copper, decided to floor it and overtake. Perfect timing and as he then becomes the focus of the coppers attention. We decide to take advantage of the reprieve and calmly pull past the copper who is still deciding whether or not to stop us as we drive away. We head for the hills. Or rather the mountains. When we looked at Google Maps we had no idea how laborious this route would be. We figured the extra 20 minutes driving was worth saving the 220 kilometers but we had figured wrong. Petrol, hours more than 20 minutes and danger outstripped it all. The road winds and turns and the slush on the road thickens as we steadily climb higher and higher. It's pretty (I suppose) but all we can really see at night is rock on one side and trees on the other. And it goes on and on and on until finally we reach the Montenegro border tucked away in a fog filled gulley with one man sitting there peering out at the glimpy barrier in front of him. Staring at us and our outstretched passports "English?" Here we go again. This time I have to drive a few hundred metres to a cafe where I am the only customer and here in a stifling room with a Slavic game show blaring out I pay another stealth payment (15 Euros). A bargain I thought. It reminds me of a comedy set by the Scottish comedian Kevin Bridges. He tells a story in his broad Glaswegian accent of how he is held up at knife point and told by his assailant "Gis us a fiver or i'll stab ya". Bridges then ponders "A fiver! Ah right, Thas nay a bad deal. Jest a fiver an I dinnay get knifed and get my night an clothes ruined. Yer on pal!" 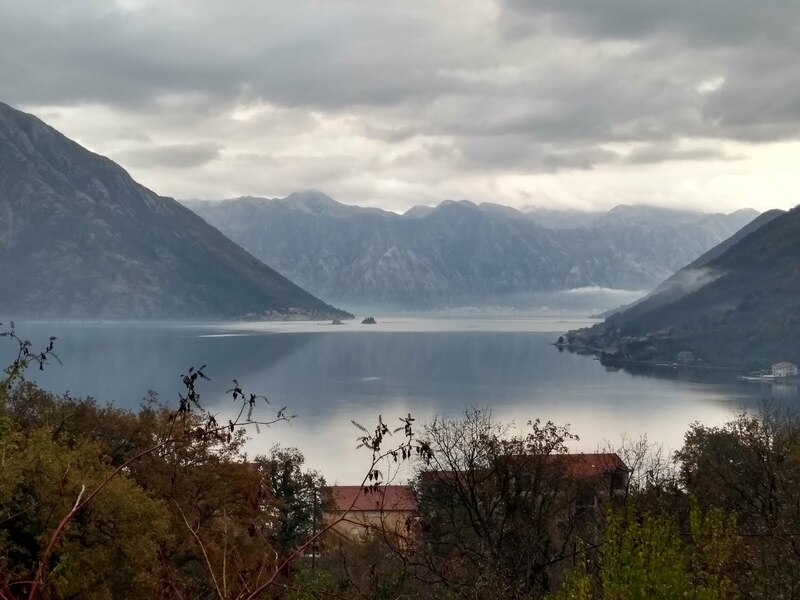 Anyway Montenegro. I don't know why I was expecting good roads. After 6 hours of driving through shite conditions I had built up the final destination into Oz. Alas the yellow brick road was actually the worse road by far. 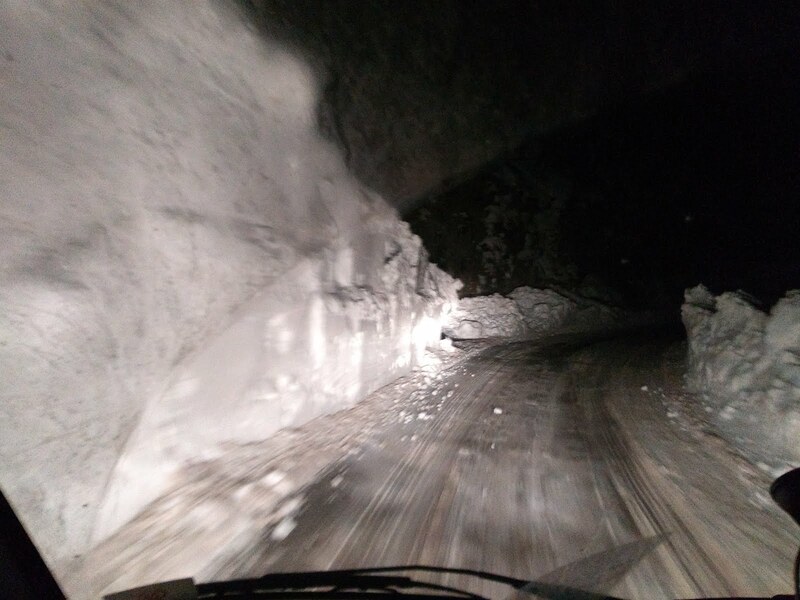 90 percent of the time it's completely covered in snow and every now and then there are mini avalanches that covered half the road. Even worse we seem to continue climbing and crawl along at about 30kph - through rough hewn tunnels through the mountains. These tunnels being lined with magnificent icicles up to 2 metres in length. The dripping water that oozed from the roof had formed pools of ice which proved interesting because our muddied headlights (with deflector shields) barely lit the road let alone the black ice. So we skudded and skidded and dodged the occasional snowplough, mad car drivers and ice piles for a further 2 hours until we started to descend and eventually found a place we could actually stop which was a disused car park by a small village near a lake. I had driven for about 8 hours and my eyes looked like a drug addict with wide staring pupils. So when we made up the bed it took a while to go to sleep. 3 hours later Rachel wakes me and says "Is that someone at the back of the van?" I was disorientated and confused (this is my excuse) and about to tell her to go back to sleep when I too hear something. So jump out of the bed, pull open the back screen and where there is normally a bike cover obscuring the view there is a clear view of carpark. A movement at the side of the van gets my attention so I grab my trousers and tee shirt and a recently acquired burglar stabbing knife. After the incident 6 weeks ago when we realised that our only proper means of defence was a Swiss army knife with which I could effectively only remove stones from an attackers shoes or possibly unscrew them a bit. We had decided then to get something a little more intimidating. A little more Crocodile Dundee with which to discourage any shenanigans. So I jump out of the van in time to see a black figure running off and realise I had made a huge mistake and was about to take on the baddie with a potato peeler. Not the pointy kind which might make sense but the safety razor type. It was dark. It was a new knife. I panicked. Luckily I didn't need to peel anyone this night so after shouting obscenities at the retreating shadow, I got back in the van and still muddled and befuddled set off to a safer location. 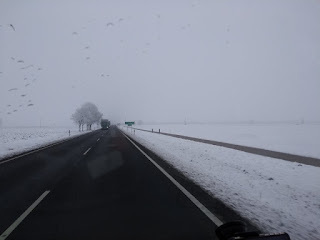 Sadly the road conditions worsened and it was another hour before we finally found a clear patch of ground - still miles from any town - at a junction with two parked gritting lorries to give us a safety in numbers feel. We dropped off immediately and the following morning - 4 hours later - after being woken by the lorries running their engines and their drivers generally preparing for a another day doing drivey stuff. We checked the bikes (some straps had been slashed and an attempt at sawing through the bike locks had begun but apart from that all was well. So we sit and eat breakfast then drive for 30 minutes more and suddenly everything was beautiful and the Montenegro we might know was upon us. 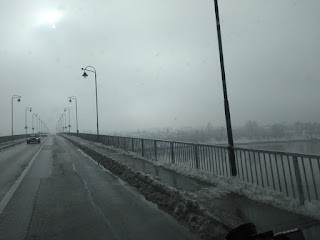 All charming, no snow, the temperature 12 degrees higher and our journey over.